Diego Velázquez (1599–1660), The Forge of Vulcan (1630) , oil on canvas, 223 x 290 cm, Museo Nacional del Prado, Madrid, Spain. Wikimedia Commons. When Diego Velázquez was appointed a Painter Royal to King Philip IV in October 1623, he became the most junior of a group of artists of varied status and influence. Among the most senior was Vicente Carducho, who had been painting religious and narrative works for the court for over twenty years. Carducho was quite opinionated, and a decade later published what became one of the standard references for Spanish art. The young Velázquez had very limited experience in religious or narrative works, and initially his court work consisted almost entirely of portraits: a genre which, though lucrative, was despised by the ‘best’ painters. For Velázquez to rise in status and influence at court, he had to become a superior narrative artist so that his work entered the royal collection on merit, rather than as a mere record of its sitter. Velázquez moved up the ladder in 1627, after a jury appointed by Philip IV recommended that his portrait of the king was superior in competition against those of Carducho, Caxés, and Angelo Nardi. The king’s reward was to appoint Velázquez Usher of the Chamber, a great honour which brought with it a free apartment, free medical care, and coincidentally backpayments which had been due to him. The king also agreed to Velázquez visiting Italy, although no date for that was set. Diego Velázquez (1599–1660), Christ after the Flagellation Contemplated by the Christian Soul (1626-28) , oil on canvas, 165.1 x 206.4 cm, The National Gallery (Presented by John Savile Lumley (later Baron Savile), 1883), London. Courtesy of and © The National Gallery, London. 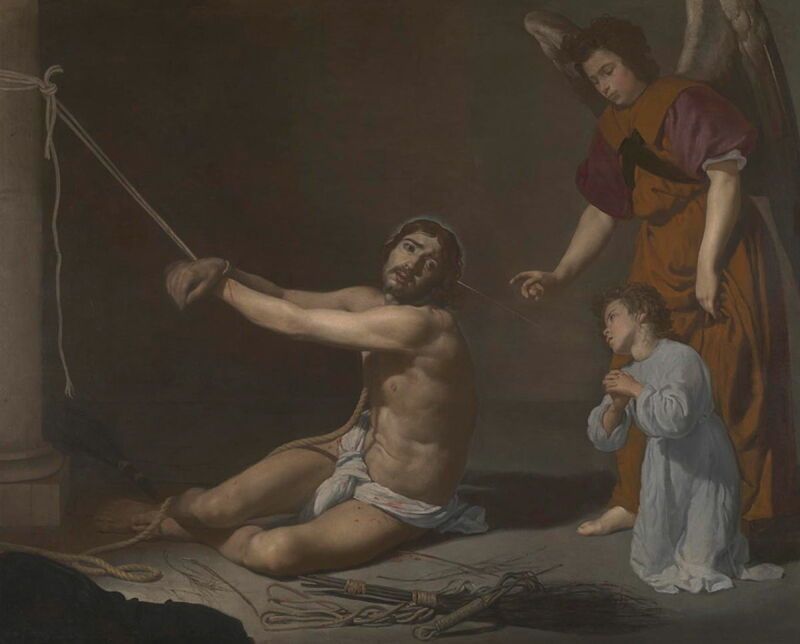 In the mid 1620s, probably 1626-28, Velázquez painted Christ after the Flagellation Contemplated by the Christian Soul. A relatively unusual motif, this shows Christ after he had been whipped and scourged, still tied to a column, and with the instruments of his suffering laid on the floor beside him. At the right, the Guardian Angel has brought the personification of the Christian Soul to contemplate Christ’s suffering. Although in previous paintings, Velázquez had preferred real models for his figures, Christ here appears to be have been based on his depiction in an Italian work from the royal collection. This is consistent with his visual distiction between the divine and the human, though. The painting is dark, no doubt on a dark ground, and could even be viewed as Tenebrist, which Carducho would have criticised, no doubt. Then, in August 1628, the great Peter Paul Rubens came to stay in Madrid while he conducted one of his diplomatic missions. Rubens and Velázquez became friends (they had already corresponded), and there can be no doubt that Rubens helped the younger artist transform his narrative works. 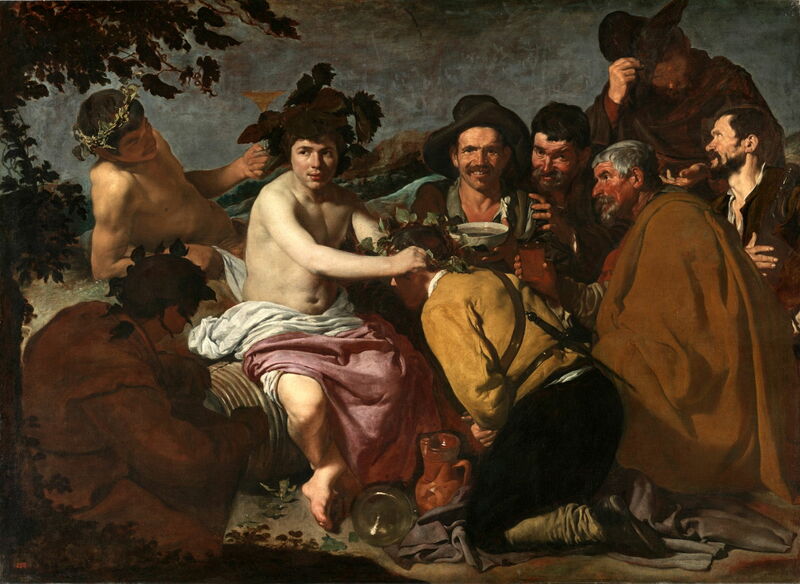 Diego Velázquez (1599–1660), The Triumph of Bacchus, or The Drinkers (1628-29) , oil on canvas, 165 x 225 cm, Museo Nacional del Prado, Madrid, Spain. Wikimedia Commons. Painted while Rubens was on hand to advise, The Triumph of Bacchus, or The Drinkers from 1628-29 marks a point of departure for Velázquez. Surrounded by a drinking party of older rugged-faced men, the young Bacchus is placing a crown on the head of a younger man, who kneels for the honour. Five of the figures are amazingly lifelike: very contemporary but also timeless, their faces and clothing telling so much about them. Compositionally, though, it is quite weak. Three of those main figures are only seen down to the chest, and their gazes are all over the place, with one staring straight at the viewer, an alcoholic grin on his face. Philip IV paid Velázquez 100 ducats – a goodly sum – for this painting on 22 July 1629. Velázquez and Rubens agreed to travel to Italy together, so the former could copy old masters and develop his skills. Unfortunately, Rubens was recalled to Antwerp, leaving Velázquez to journey without him. I sometimes wonder what the result would have been had the pair gone together. Velázquez left Madrid in August 1629, and headed first to Genoa by sea, then overland to Milan and Venice. From there he travelled on to Rome, where he stayed for almost a year in rooms in the Vatican Palace. Diego Velázquez (1599–1660), Joseph’s Bloody Coat Brought to Jacob (1630) , oil on canvas, 213.5 × 284 cm, Monasterio de San Lorenzo de El Escorial, Madrid, Spain. Wikimedia Commons. Velázquez’s main task during his stay in Italy was to learn from the old masters by copying and studying their work. Two narrative paintings have survived from his travels, both of which are presumed to have been made while he was in Rome. 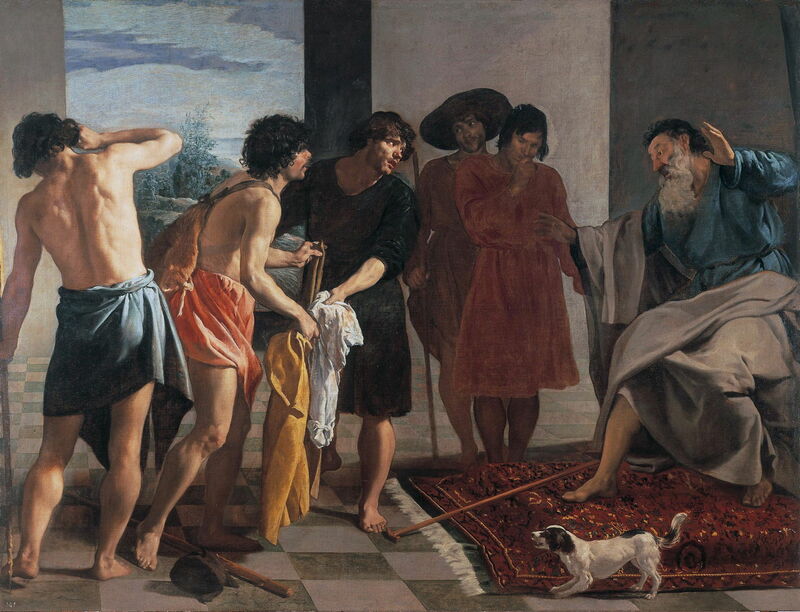 Joseph’s Bloody Coat Brought to Jacob (1630) shows the crux of this well-known story from the Old Testament. When living in Hebron, Jacob’s favourite son Joseph was the subject of intense jealousy from his half-brothers. When those half-brothers were grazing their father’s flocks in Shechem, Jacob sent Joseph to discover how they were getting on. The half-brothers returned to Jacob bringing with them Joseph’s distinctive ‘coat of many colours’ covered with blood, which Jacob presumed was evidence that his favourite son had been eaten by a wild beast. In fact, the half-brothers had sold Joseph into slavery. Velázquez shows here how much his compositional skills had improved, even down to the light amusement of the barking dog. Although in much brighter style, he still used a relatively dark ground, though, and this is probably the last painting in which he did. This was followed by his first narrative painting based on Ovid’s Metamorphoses, The Forge of Vulcan from 1630. 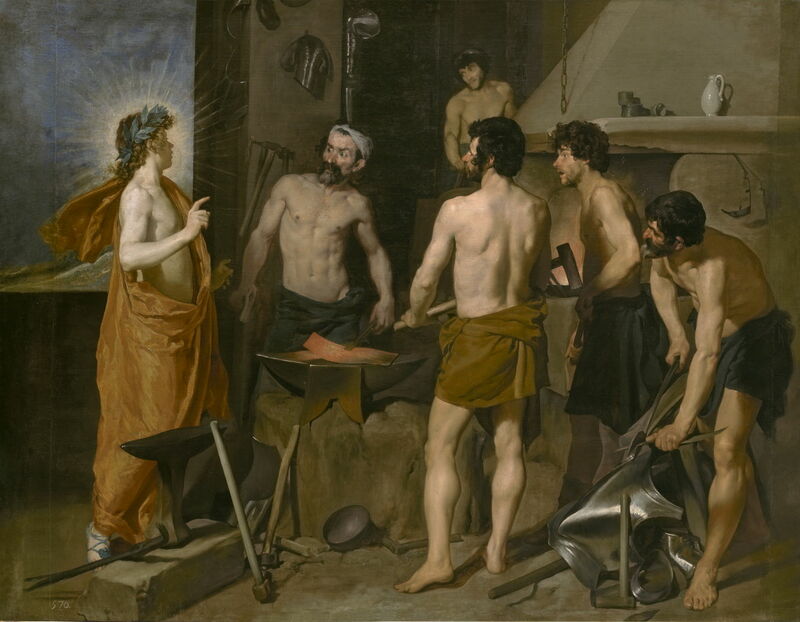 This shows Apollo, at the left, visiting Vulcan (to the right of Apollo) in his forge, to tell him about the infidelity of Vulcan’s wife Venus. As shown in the faces, this arouses great shock. 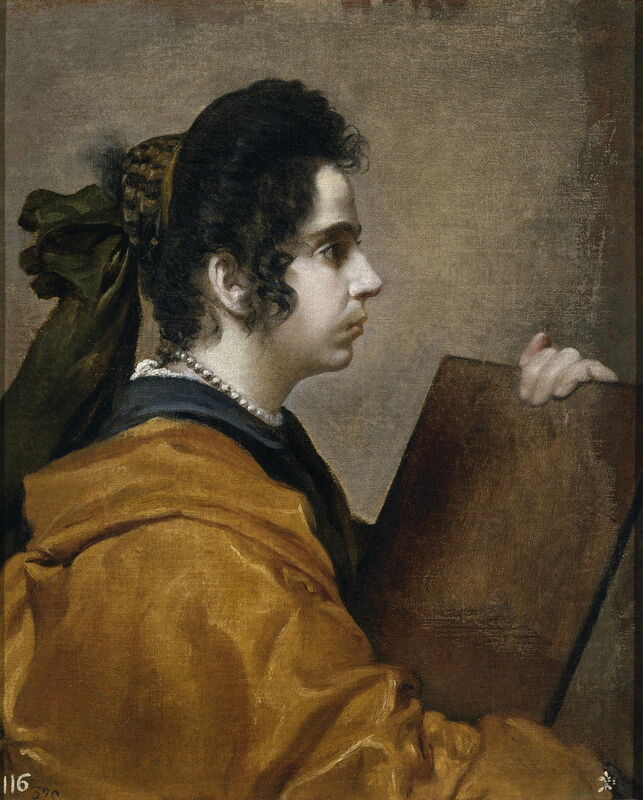 Although it has dark passages in the background, this is the first of Velázquez’s paintings in which he used a white ground. His modelling of the figures is brilliantly natural, and they integrate fully into the painting as a whole. What we see here is quite different from the artist’s initial painting: radiography reveals extensive changes, and his original canvas was extended on both sides to accommodate them. Velázquez’s facture is also much more varied, ranging from thick impasto on Apollo’s tunic and the sheet of hot metal being worked, to dry brushstrokes in Apollo’s halo, and thin layers of paint for much of the background. He was developing virtuoso technique. When Velázquez was staying in Rome, he spent two of the hottest months of the summer at the Villa Medici. Although the two landscape paintings which he made in its grounds are strongly suspected to have been made during this first visit in 1630, proof is lacking. If that is correct, they were probably the first landscape oil sketches made en plein air in European art. 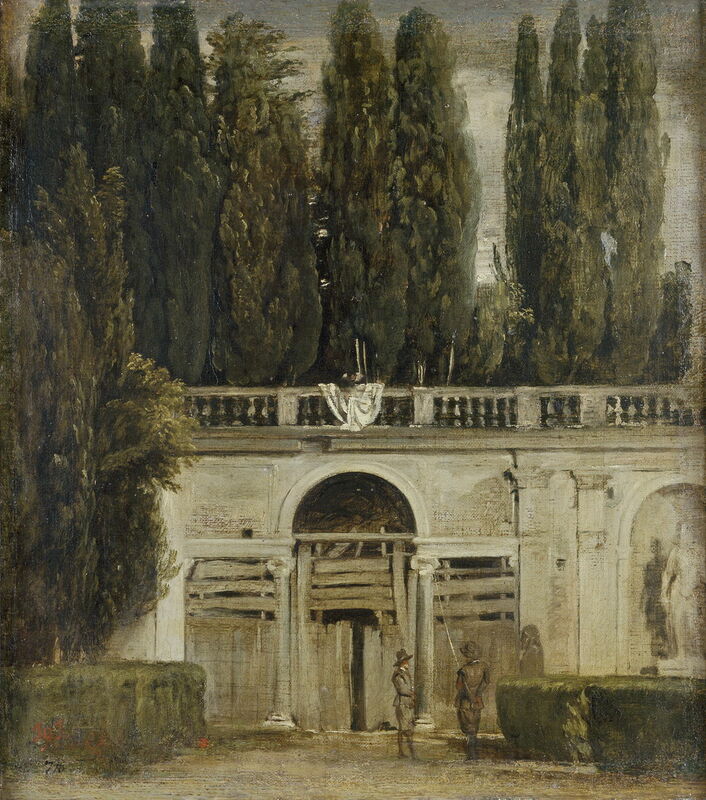 Diego Velázquez (1599–1660), Villa Medici in Rome, Pavilion of Ariadne (1630) , oil on canvas, 44.5 x 38.5 cm, Museo Nacional del Prado, Madrid, Spain. Wikimedia Commons. 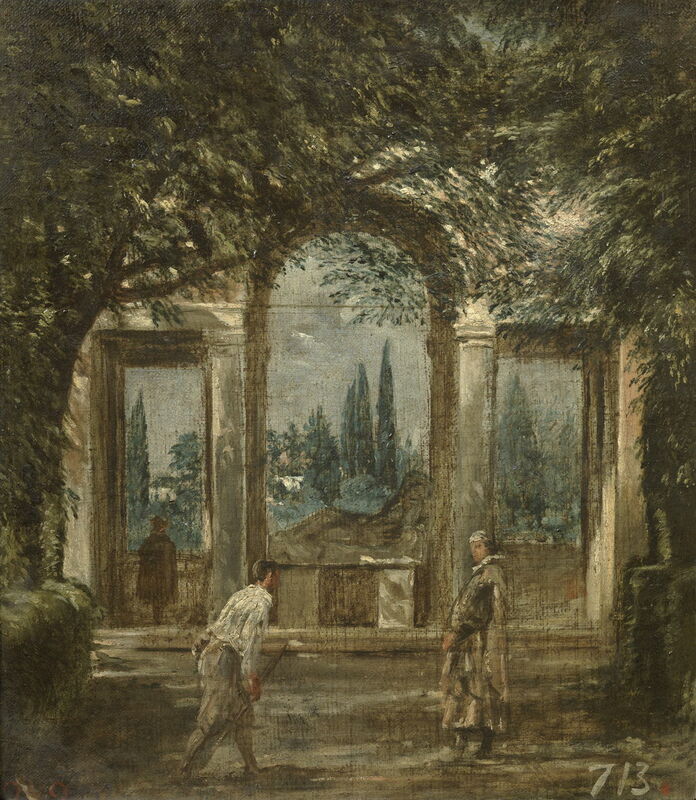 Villa Medici in Rome, Pavilion of Ariadne (1630) shows one of the sculptures which Velázquez had been interested in drawing. It is relatively small, and as the detail below confirms, has been executed in a very sketchy manner, with thinned paint which has subsequently abraded from patches of the surface. 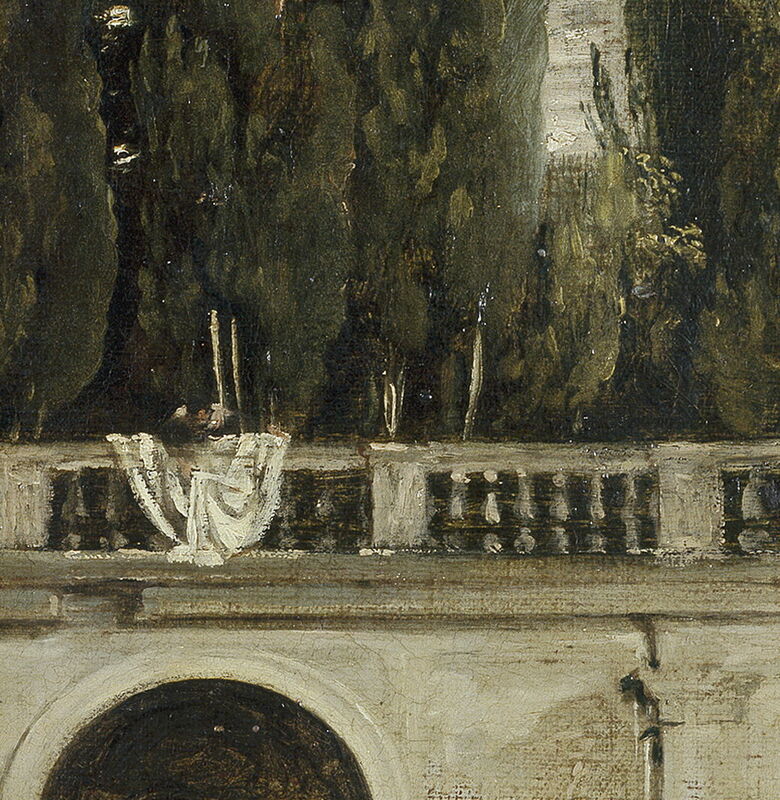 The columns and arches are quickly formed, and the details of the two figures in the foreground are made from a series of quick brushstrokes, some with thicker paint. Diego Velázquez (1599–1660), Villa Medici in Rome, Pavilion of Ariadne (detail) (1630) , oil on canvas, 44.5 x 38.5 cm, Museo Nacional del Prado, Madrid, Spain. Wikimedia Commons. The second landscape to have survived is Villa Medici in Rome, Two Men at the Entrance of a Cave (1630), which is the better-preserved. This shows the entrance to a grotto, which is thought to have been undergoing repair at the time, and is therefore boarded shut. 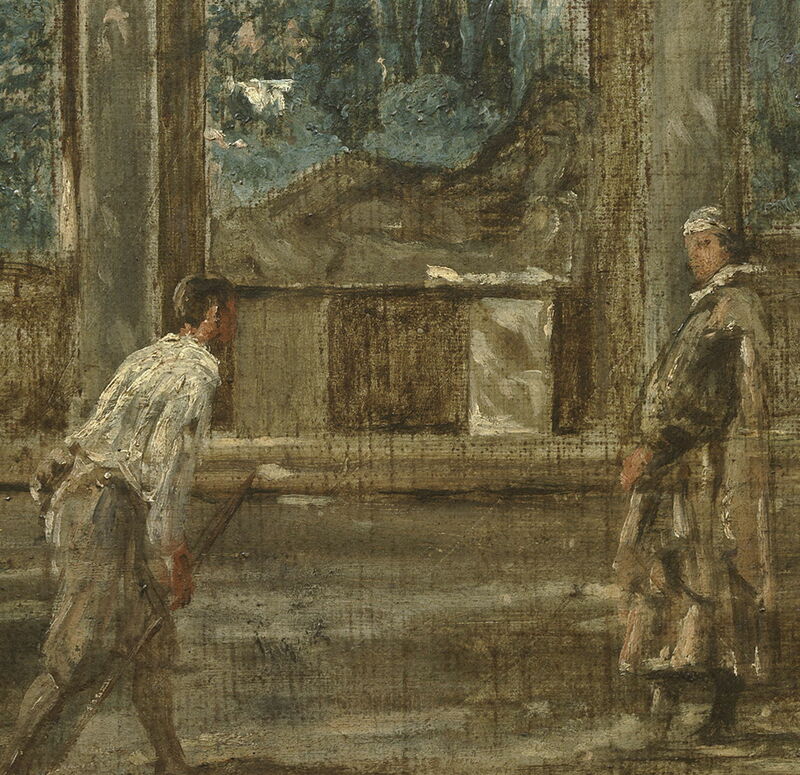 The detail below again shows evidence that Velázquez was working quickly to produce a sketch. Diego Velázquez (1599–1660), Villa Medici in Rome, Two Men at the Entrance of a Cave (detail) (1630) , oil on canvas, 48.5 x 43 cm, Museo Nacional del Prado, Madrid, Spain. Wikimedia Commons. In 1675, Joachim Sandrart claimed the he and Claude Lorrain had also painted landscape sketches en plein air during the 1630s, but no trace of those works has ever been found. These two small and quite modest landscapes thus remain the earliest such works of their kind, major milestones in the history of painting in Europe. Diego Velázquez (1599–1660), Sibyl (1630-31) , oil on canvas, 62 x 50 cm, Museo Nacional del Prado, Madrid, Spain. Wikimedia Commons. Soon after his return from Italy, by January 1631, Velázquez painted what was then quite a popular motif, in this Sibyl from 1630-31. Sibyls were prophetesses in classical times, and during the growth of the early Christian church somehow became mixed up in prophecies of the coming of Christ. By the time of the Renaissance, it was believed that ten or twelve Sibyls had foretold the birth and ministry of Christ, and they were quite widely depicted in art. I will look at this in more detail next weekend. Velázquez has painted a portrait of a woman who conforms to the common pattern of a Sibyl: she is modestly dressed in exotic robes, looks earnestly into the distance, and holds a writing tablet (although it is empty). Her hair is bound up in a headdress, although not completely covered as in some other depictions. Another suggestion is that this is a portrait of his wife Juana, who would have been about 30 at the time. Velázquez was back in court. Posted in General, Life, Painting and tagged Carducho, Claude, landscape, Lorrain, Pacheco, painting, plein air, Rubens, Sandrart, Sibyl, Spain, Velázquez. Bookmark the permalink.